This is not an uncommon occurance, and I receive many calls and emails from folks that see this when they open their box for monitoring. Early in the season, Mardy called and said that there was a Chickadee that had taken over occupancy of the box that we put up specifically for the Bluebirds. As usual, I asked her to please allow the Chickadees to continue their nesting and then, after she removes the spent nest, perhaps the Bluebirds would come and try again. Several days later, I received another call with the information that the Bluebirds were now there, having decided to use the nest, and they were "fighting" for the right to use this box. It seemed all was well, as several days later, there was laid one egg. Yea, it seemed that the Bluebirds would prevail and have their nest.... Never speak too soon when trying to determine what will happen in nature. By this time, the House Wrens had arrived in the area, and they had a different idea for that nest box. It is now clear that the Wrens have prevailed. 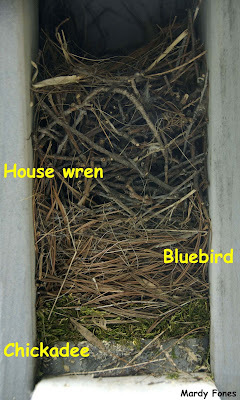 When the Wrens have finished, Mardy may remove all the nesting material and then possibly get a nesting pair of Bluebirds to take up residency again. Lucky for us, Bluebirds will nest several times during the season.